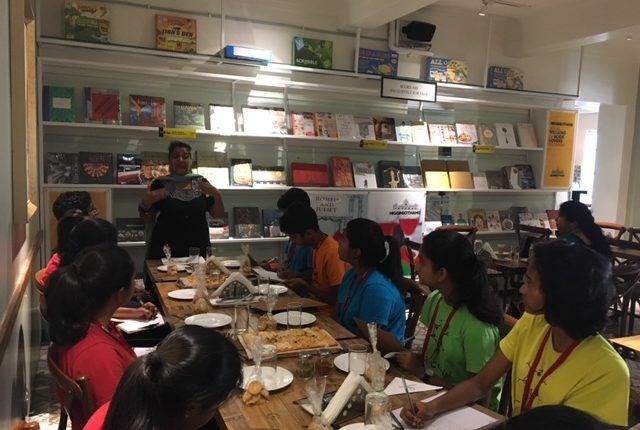 The children of Grades 10 and 9 visited a Cafe in the city, Writer’s Cafe, on Peter’s road, Gopalpuram. The trip was planned in order for them to explore their business studies units and Language arts units. But, the trip required them introspect at a different level all together! The cafe is the brainchild of businessman and philanthropist, Mahadevan. He, who had just returned from a Europe tour, introduced the children to two of his star chefs and told us that they had been invited to Paris for taking classes for a local school there. It was simply amazing to see two burn victims,with the scars to show an extremely hard previous life, look and smile confidently at the children. Their grit and determination to use this new lease of life to their optimum was evident in their eyes. Our children looked sober and reflective as we left the cafe- their stomachs full, hearts lighter and minds churning. It takes only one man/woman with his/her heart in the right place to make an impact that will benefit masses. I hope that many of our students will follow his footsteps and make an impact in the lives of those who are not as fortunate as they are. As for now, the KC kids were superb in behaviour, in seeking information and in communicating their gratitude to the staff for their magnificent hospitality!